Dr. Ulissey is an Assistant Professor of Radiology and the Director of Breast Imaging, The University of Texas Southwestern Medical Center at Dallas, Dallas, TX. The first computer-aided detection (CAD) unit for mammography became commercially available in June 1998. Since then, multiple vendors have entered the CAD arena and new vendors are still entering the market today (Table 1). The number of CAD units used in clinical practice worldwide continues to grow, and many are now married to full-field digital mammography units. Perhaps the cutting-edge novelty, in part, has fueled CAD research and development during the last several years, but this growth has not come without controversy. With the rapid growth of any new piece of diagnostic radiology technology, there is the potential for misunderstanding its proper use. Questions have been raised regarding the use of CAD (Should it be considered the standard of care? ), the utility of CAD (Does it really help the trained radiologist? ), and the potential legal ramifications regarding the use of CAD (Will I be sued if I use CAD, or will I be sued if I don't?). These and similar issues will be discussed in this article. In order to present the applications and repercussions of CAD, this article will pursue a 3-fold approach. First, the author will present a historical overview of the use of CAD in the nonmedical arena to illustrate how the idea evolved that CAD could benefit mammographers. Some representative CAD literature and developments since 1998 in the potential benefits and applications of CAD are reviewed. Finally, the article considers controversies that have arisen as a result of clinical, research, and legal applications of CAD. The views expressed are based on the author's experience, research, and interactions with colleagues involving the use of CAD. Before considering how computers have been used as detection devices in radiology, it is important to first look at how they have been used as detection devices in nonmedical applications. Oil companies spend tremendous amounts of money and other resources to explore and drill for oil. 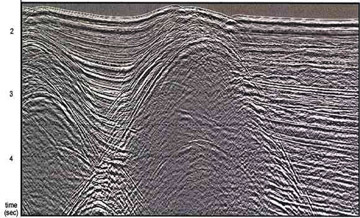 Part of this process involves the analysis of seismic data. Imagine a geologist having to analyze reams of printed seismic data to determine the best place to drill. Many wells are dry or produce little, which can waste large sums of money. Oil companies found that they could feed seismic data into computers that are "trained" to analyze those data and to indicate areas that would be more likely to harbor substantial oil deposits. Oil companies quickly learned how this application of computer technology could benefit their bottom line and were able to reduce expenses and increase profits using computers to more efficiently and accurately analyze large amounts of raw data to look for very specific patterns (Figure 1). Computer analysis was initially introduced into medicine outside of radiology. In the emergency department of the 1980s, electrocardiograms (ECG) offered computer interpretation to supplement the physician's interpretation. For decades, it was well-known that physicians occasionally misdiagnosed patients with myocardial infarction, sometimes because of inaccurate assessment of the patient's ECG. Vendors found they could program a computer to analyze the ECG readout and prompt the interpreting physician to note certain key findings (Figure 3), a capacity that is standard on most ECG units today. The analogy of the Where's Waldo? (Handford, M. Cambridge, MA: Candlewick Press) books, in which the reader hunts for the distinctive appearance of Waldo embedded in a confusing and distracting background of other characters, has been used to describe the search for breast cancer on mammograms. While it is not a bad analogy, it needs some modification. Imagine trying to find Waldo if he and the background were both black and white instead of color. Imagine trying to find Waldo if he were not guaranteed to be in every picture, perhaps in only 4 per 1000 images. To make the game even more interesting, if you miss seeing 1 Waldo in 1 picture, you might lose your car, boat, house, or children's college education. Perhaps that's closer to the "mammographic version" of Where's Waldo? Could a computer be trained to recognize Waldo on a mammogram? If computers could help as detection devices outside of radiology, the idea developed that they could be trained to recognize the findings of potential malignancy in the sometimes cluttered and confusing background of a mammogram (Figure 4). To pursue this question further, R2 Technology, Inc. undertook the first commercial CAD venture in mammography in 1993. Their research, and that of other companies, seemed to support the notion that CAD could aid in mammography interpretation 3,4 and, ultimately, led to the U.S. Food and Drug Administration (FDA) approval of the first U.S. CAD unit in June 1998 (R2 Technology, Inc., Sunnyvale, CA). Initially, clinical research aimed at validating the claim that CAD units could indeed help detect breast cancer that otherwise might be overlooked on a mammogram was primarily retrospective. 5,6 In 2000, Warren Burhenne et al 7 published a seminal paper relating to breast cancer and CAD-supported detection. Their results highlighted 2 important points relative to CAD and breast cancers missed on mammograms. First, it showed that CAD indeed had the potential to detect cancers on mammograms that had been previously interpreted by radiologists as normal. Second, it provided an in-depth analysis of the radiology community's overall false-negative rate in screening mammography. The researchers collected mammograms from >1000 women who had newly detected breast cancer (the incident mammogram). The imaging centers were both academic- and community-based and were drawn from a variety of radiology practices that represented a reasonable spectrum of current mammography being performed in the U.S. at that time (personal communication, Linda Warren Burhenne). All practices were centers certified by the American College of Radiology (ACR) and Mammography Quality Standards Act (MQSA). For each incident mammogram, the researchers made great efforts to obtain the woman's most recent prior mammogram-the one that was interpreted as normal 1 or 2 years prior to the incident mammogram being identified as abnormal. 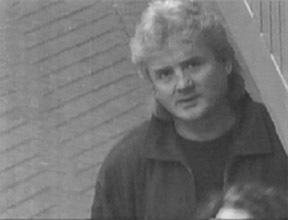 The research team then focused on those prior films that had been interpreted as normal. They convened a panel of radiologists to review the prior studies and form an opinion as to whether the prior study showed evidence of breast cancer, and if it did, whether that finding was "actionable" or "reasonable to let go." The panel opined that cancer was indeed visible on the prior normal mammogram 67% of the time. While the panel agreed that in the majority of cases the finding still did not merit recall of the patient for further evaluation, they also agreed that 27% of the cancers were not only visible, but were actionable on the prior study--in fact, the mammogram that had been called normal should have been acted upon. Those patients should have been recalled for further evaluation. Basically, a spectrum of radiologists who were professionally qualified had "missed" 27% of breast cancers on mammograms they had interpreted within the prior year or two. The researchers then focused on the prior studies that had visible and actionable findings but that had somehow been interpreted as normal. A CAD unit analyzed those studies and successfully marked the missed cancers on the prior study 77% of the time. This led the authors to conclude that if the radiologist had been using a CAD unit at the time of the original interpretation, 21% more cancers would likely have been detected 1 or 2 years earlier than they actually were (and possibly at a lower stage). Retrospective studies had shown that CAD had the potential to detect breast cancer earlier than it otherwise would have been detected, but they had not shed light on how CAD performed in the day-to-day practice of a community-based breast imaging center. Yet, this is probably where the majority of mammography is being done in the United States. One of the first large prospective studies regarding CAD in mammography was published by Freer and Ulissey 8 in 2001 and was based on data collected at their facility during 1 year, from early 1999 to early 2000. The project was done at a freestanding, full-service, community breast imaging center. In late 1998, the center purchased a CAD unit and the purchasers wanted to know if they had made a wise investment. Although the unit was already purchased, issues of maintenance agreements, upgrades, and possible new equipment were being considered. The study was designed to answer several questions: 1) Could CAD detect cancers that the radiologist did not? 2) If CAD prompted the detection of additional cancers, at what stage were those cancers? (a CAD pick-up in stage 0 or I might be beneficial to patients, but a stage IV diagnosis would have questionable clinical utility) 3) What was the baseline patient recall rate, and did it change with the application of CAD? 4) What was the positive predictive value (PPV) of a breast biopsy performed without CAD, and how did it change with CAD (ie, would CAD prompt the performance of more negative biopsies)? 5) What was the diagnostic cost of breast cancer without CAD versus with factoring in the expense of additional recalls, further imaging, and biopsies (if performed)? and 6) How much extra time did it take to read mammograms with CAD versus without? 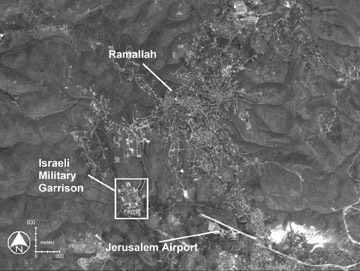 At the request of the journal Radiology , the cost and time issues were not published as part of the original article, but were withheld for possible future use. Over the course of 1 year, Freer and Ulissey interpreted nearly 13,000 screening mammograms. They initially read the mammograms without the benefit of CAD analysis, and then engaged CAD and reviewed the CAD-prompted areas. The results demonstrated that CAD prompted the discovery of >19% more cancers than would have been found in the initial interpretation. The additional cancers found were either stage 0 or stage I, indicating a likelihood of significant clinical impact. The PPV for biopsy performed after CAD use did not drop below the baseline that was determined before CAD use, which indicated that CAD did not influence the decision to perform a biopsy. The recall rate rose from 6.5% to 7.7%, but this was coincident with the increased number of cancers detected. This prospective experience, as well as the analysis of the individual cancers detected during that year, helped to solidify the current author's opinion that CAD can be beneficial to a community-based mammography practice. In this study, the interpretation of 60 mammograms without CAD took roughly 1 hour. With the use of CAD, those interpretations took approximately 75 minutes, an increase of 20%. The use of CAD led to the recall of roughly 20% more patients, led to the detection of approximately 20% more cancers, and required roughly 20% more time to interpret. Because CAD prompted more recalls and, thus, more diagnostic evaluations and biopsies, this added cost to the overall use of CAD. However, the overall cost to detect a breast cancer dropped after CAD application. This occurred because charges for additional workups were averaged over the additional breast cancers detected, which resulted in a net lowering of cost for detecting each cancer. However, it is important to realize that CAD does not "catch more cancers." There is a given prevalence of breast cancer in the population, and CAD seeks to identify some of those cancers earlier than they might otherwise be detected. The notion that CAD lowers the cost of detecting breast cancer might not be valid, as those cancers would still ultimately be detected, but the earlier detection of those extra cancers, at a lower pathologic stage, remains a very important point. Since the study of Freer and Ulissey, 8 multiple other studies have been published regarding CAD in mammography. Some studies tend to corroborate the notion that CAD can be helpful 9,10 and some indicate CAD may not be helpful, at least not to the well-trained radiologist. 11 There are also studies that indicate that CAD may not be as helpful in detecting masses and architectural distortions as it is for calcium identification. 12,13 Some articles have been controversial, such as that of Gur et al. 14 Well-worded rebuttals have already been published, 15 so this author does not wish to further review the debate. There is no doubt that future articles will continue to support and refute the value of CAD for mammography. In time, the data will bend in a clear and convincing direction, and the author believes that further well-designed studies will determine the ultimate fate of CAD. CAD as the standard of care? When did a magnifying glass become standard of care? The author can imagine that there must have been a time when people did not read radiographs or early mammograms with a magnifying glass. There came a day when someone picked up a magnifier and put the word out that he or she could interpret some studies better with it than without. He or she told 2 friends, and so on, and so on, until one day everyone was using magnifying glasses to read some plain radiographs and virtually all conventional mammograms, and, thus, it evolved into the standard of care. 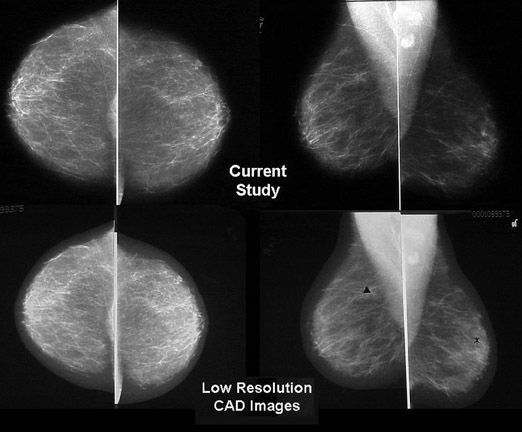 As more and more studies corroborate that CAD helps detect additional breast cancer, even if only occasionally, more and more centers will invest in CAD equipment, and thus one day it will just be the standard of care for mammography interpretation. This author can imagine that day coming sooner rather than later. During the author's study, CAD helped to detect 8 additional cancers. In subsequent years after the study, CAD did not help as much--perhaps detecting only 1 or 2 cancers annually. The number of studies interpreted increased 2- to 3-fold during that period. One possible explanation for this result would be improvement in reader interpretation brought about by CAD. Another is a first-round effect-that is, on the first round of application of this new technology some cancers in the population are "weeded out," thus lowering the number detected in subsequent years and decreasing the apparent CAD benefit. 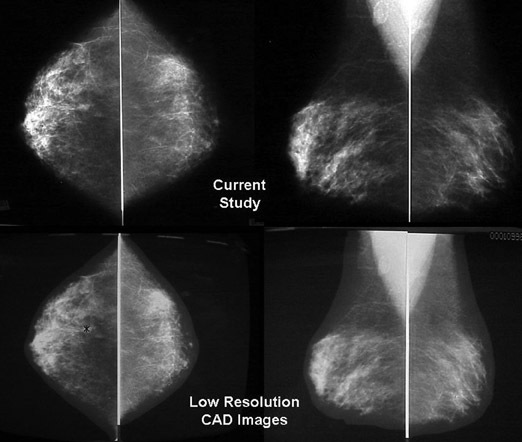 Regardless of whether CAD helps to detect 1 or 2 additional cancers a year, or adds no benefit, several well-trained and experienced breast radiologists have personally told me they are more "comfortable" reading mammograms with CAD than without. It is natural to ask, "Will I be sued if I use CAD?" Concern over possible litigation is common among radiologists, especially mammographers. However, the answer may not be straightforward. We know from recently published literature that CAD marks some items on mammograms that later turn out to be breast cancer 16 but were nonetheless not areas of concern at initial screening. The same literature also indicates that it is reasonable to "let those findings go," since the findings must be judged on the merits of the mammogram, not on whether CAD marked a particular area. Since a large number of CAD marks do not merit recall evaluation, "letting go" a CAD mark that later turns out to be breast cancer is an entirely reasonable action if the mammogram is consistent with a benign finding. Even though that finding might later turn out to be cancer, it would not have yet developed enough of a mammographic footprint to be identified at screening. The current author and colleagues have recently written an article detailing CAD in the courtroom. 17 In the first U.S. legal case involving CAD, which was reviewed and upheld by an appellate court, CAD was used successfully to help defend a radiologist, not prosecute one. Perhaps, if we use it correctly, CAD will become our greatest ally. In posttrial interviews, the jury said they found that when one expert witness says "obvious cancer" and another expert witness says "obviously not," it was useful for them to have an objective computer review of the mammogram, which in this case helped corroborate the defendant's position. CAD has been approved by the FDA for use in other radiology applications, including lung CT, virtual colonoscopy, and breast MRI. CAD is also undergoing transition from a pure detection device to a diagnostic one. There is evidence that a computer can be trained not only to help detect mammographic abnormalities but also to assist in diagnosing them. 18 Buchbinder et al 18 used computer analysis to review 106 breast lesions that at least 2 blinded breast radiologists had classified as BI-RADS-3 (probably benign). However, 42 of the lesions were known to be malignant (by the researchers). The computer was able to correctly upgrade 38 of the 42 lesions to either BI-RADS-4 or -5 (suggestive of or highly suggestive of malignancy). 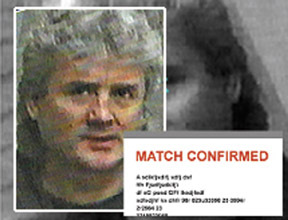 In contradistinction to computer-aided detection , computer-aided diagnosis (CADx or CAC, as it has been called) is clearly on the horizon. Undoubtedly, the use of CAD will expand in the future to further medical as well as nonmedical applications. CAD may come into common usage for personal identification of people in public places such as shopping malls and airports. 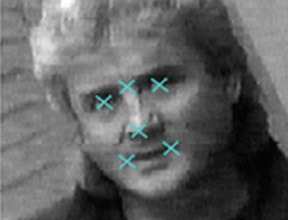 Computers already have the ability to extract certain facial features from cameras and compare them to databases of known criminals, missing persons, or potential terrorists, allowing prompt recognition and action (Figure 5). Regardless of whether we are looking for malignancy on mammograms, faces in a crowd, or the missiles of an enemy, CAD will help us play the game of hide and seek. Computer-aided detection in mammography: Applications and repercussions. Appl Radiol.